I just can't get enough of the knitted design Distinction by Caitlin Ffrench. I stumbled upon it on Ravelry and made it for a friend of mine out of Malabrigo Mecha. 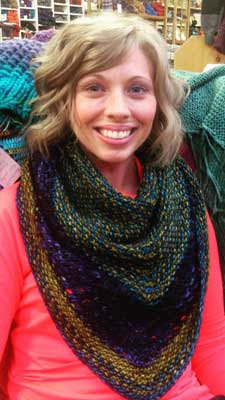 She adored it and I decided she is definitely knit worthy(unfortunatley I did not take a picture of it and have not seen her in awhile, so I can not share it with you).! 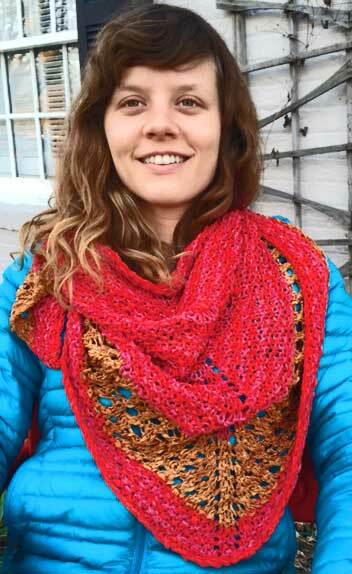 Luckily our own Caitlin came to my rescue and knitted a store sample for us out of Mecha. The floor sample created a lot of interest and all of the sudden we are seeing many different color combinations, all beautiful and all wool. All of the interest made me want to knit one again, but one for the summer and not made out of wool. I decided to use Colinette Giotto because it is one of my favorite cotton blend yarns. Silky, drapey and saturated with color I decided on Vatican Pie as the main color. The person I wanted to give this to will look fantastic in the color. My family member has had a terrible year, too many things happening to one good person. I want her to know that I think of her daily, and definitely send her good feelings every day. She is not up to conversing and that is why I needed to find another way to communicate my love to her. I am sure she will feel every good feeling that went into the piece and I can only hope it will lift her through the tough days.I did take a picture this time, and the sample is in the mail. Guess what I just started again....yes out of Giotto. This time, this one is for me!